Russian Language Ambassadors in the World program is gaining popularity: in 2017 its participants made 14 expeditions and visited 12 countries. 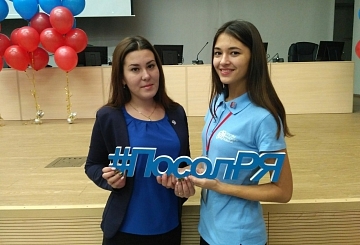 As it follows from the report on the results of the expeditions, Altai State University was granted a status of the Supporting University in the Russian Language Ambassadors in the World international volunteer program in the framework of the Media Forum “The Russian Language: Education, Communication, Partnership” which was held on November 6–9. In total, the status of the Supporting University was given to ten federal Russian higher education establishments. Evgeniya Yaroshenko, a student of the Faculty of Mass Communications, Philology and Political Science, joined the program. On December 9–17, after training, Evgeniya went on an expedition to Baku, where she worked at school and Azerbaijan University of Languages. The participants of the program conducted classes on the Russian language and Russian culture: Evgeniya and her students, in addition to the Russian language lessons, danced and sang, played the spoons, made dolls, staged a fairy tale, painted Russian nesting dolls and got acquainted with folk crafts. "It was very pleasant to work with the students. 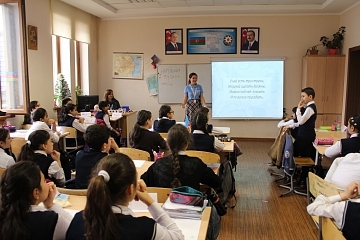 We appreciated their lively interest in the Russian language and Russian culture, their temperament and enthusiasm. The students were very active and told us many interesting things about their country. Out of the 40 people in each class, about half spoke Russian, but everyone wanted to work and answer. While absorbing the culture of each other, we found the common language, prepared a final concert, where we sang a song about friendship and danced quadrille. It was also very nice when the students asked us not to leave after each lesson. They said that they loved Russia and wanted to come visit us. The students keep in touch with us even now. After all, we left a trace in their souls, lit a spark of love for the Russian language in them and the desire to continue studying it. It means everything was not in vain!" said Evgeniya Yaroshenko. 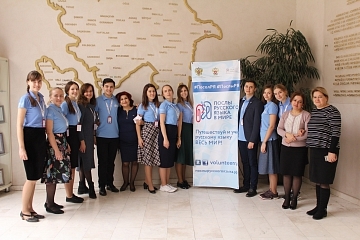 Russian Language Ambassadors in the World is an international volunteer program realized by Pushkin State Russian Language Institute with the support of the Ministry of Education and Science of the Russian Federation. The participants are students, postgraduates and young professionals aged from 18 to 30 years. The program was established in 2015 and it continues to expand and involve more people in its work. The participants of the program have already visited such foreign countries as Azerbaijan, Armenia, Bahrein, Vietnam, Kazakhstan, Kyrgyzstan, China, Moldova, Peru, Portugal, Tajikistan, Uzbekistan, Croatia, and Ecuador.